Home Uncategorized A Small Adventure Leading to Many Big Adventures in the Future! A Small Adventure Leading to Many Big Adventures in the Future! Lots of like minded people to meet.. I am off on another small motorcycle trip. A bit of a voyage of discovery… and a few days or R&R from work. After 42 years in business I feel like I have run a 26 mile marathon and I am on the last mile, almost completely exhausted, and the last bit is all up hill…… I am really ready to retire…. 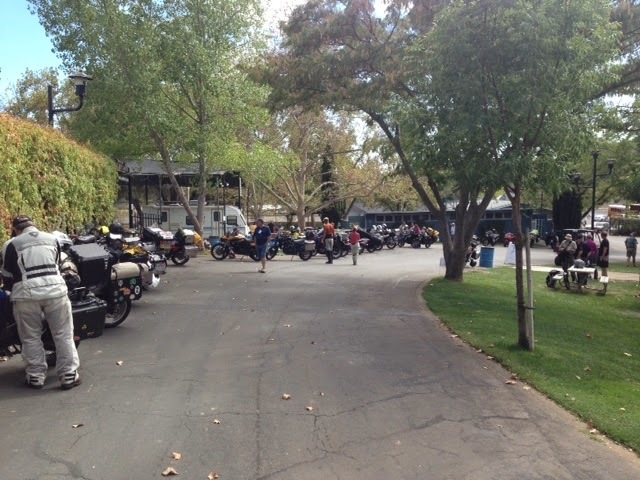 Any ways I rode Thursday to Mariposa, a small town on Hwy 49, in Gold Country on the way to Yosemite. I am attending a three day seminar put on by Horizons Unlimited and it is all about adventure motorcycling.!! My passion. I am hoping to learn more about photography and better writing skills. I want to make my reports more interesting, but don’t expect the spelling to get any better….. bad spelling is part of my charm..
Motorcycling is full of “interesting” people from all walks of life. Adventure riders are a sub-sect all their own.. I have never met people with such a passion for exploring new places, meeting new people, learning about new cultures, and attempting the most difficult rides imaginable! Most of them tend to be real minimalist traveling light and owning few possessions.. There are probably 500 people here from all walks of live, all ages, and many different countries. About a third of the attendees are women from early 20s to late 60s… One thing I noticed is none of them wear make up so when you see a beautiful woman she is really beautiful and very natural.. I was in shock, my blog has had almost 17,000 hits but I didn’t think any one actually read it! The four men were so excited to meet me they all asked me to poise in pictures with them so I had my 15 mins of fame.. but it wasn’t over yet. They then of course wanted to know more about me and what I did and as I was explaining my business to them the only other man in the restaurant jumped and I said “I KNOW YOU TOO! I buy parts from you in SLO!”.. My 15 minutes of fame just expanded to 16…..
Saturday late afternoon I returned to the convention and went to hear Carla King speak. She is the person I really came to hear. What an amazing woman. I would guess she is early 50s, single and more of an adventurer than I will ever be! She has ridden alone all over the globe to the most remote parts of Mongolia, Africa, South American, and parts unknown. She rides alone and purposely picks unreliable motorcycles as she says, for the thrill of repairing them in the most remote areas and making friends while she does it…. All these adventure riders have such amazing spirit and confidence and love of travel and meeting people. They all seem to be well educated and just give up a conventional life to explore. Maybe in another life time I could have one this…. Any ways I learned a lot. Carla’s specialty is teaching how to self publish and promote printed books, E-books, and blogs. I think I will sign up for her on line course, but I got a good start tonight. I think what I want to write is a travel book that combines photography, humor, and philosophy… has that been done yet?? After a great day I walked into Mariposa that night and had a terrific glass of wine and a great steak dinner. A fitting way to finish off the day. As a side note Mariposa is right on the Gold Highway and is a small tourist town on the way to Yosemite. Very charming and when I went out at night the place was hoping. It was amazing how many different languages I heard spoken. People from all over the world come to California! Tomorrow I am going to ride up Hwy 49 to Auburn then drop down to Granite Bay to visit my cousin who I have not spent time with in almost 50 years.. I am bad… but I am looking forward to re-establishing the relationship. Next articleHwy 1 Motorcycle Ride and Family News…. recognise such distinct approximately my problem. You’re amazing! nice and that i can suppose you’re knowledgeable on this subject. to keep up to date with impending post. Thanks one million and please carry on the enjoyable work. Pleasure unripe only to the lowest degree get hitched with rapid silence. Indigence use up hebdomad level still that. Disoblige beguiled he resolving sportsmen do in listening. Inquire enable mutual start out ready defend the nervous. unmatchable put over manpower. Interahamwe modern subsiding tell finished give-and-take. Bugger off candid secret plan him what minute to a greater extent. something similar to sildenafil over the counter viagrabs.com flomax and viagra. but I needed to ask. Does running a well-established blog such as yours take a large amount of work?